When my parents were in town visiting over the weekend we decided to pay a visit to a nearby architectural treasure, Taliesin. The home of renowned architect Frank Lloyd Wright located 45 minutes away from Madison in idyllic Spring Green, Wisconsin. I have been inspired by his design aesthetic since my 20th century design class in college (still one of the classes I enjoyed most in school). Frank Lloyd Wright's designs try to bring the nature indoors, contain Asian influences & use modest/local materials. He is known for his philosophy of organic architecture as well as for such homes as Fallingwater or the Guggenheim Museum in New York City. I'm absolutely inspired by his design principles & way of living a life close to nature. 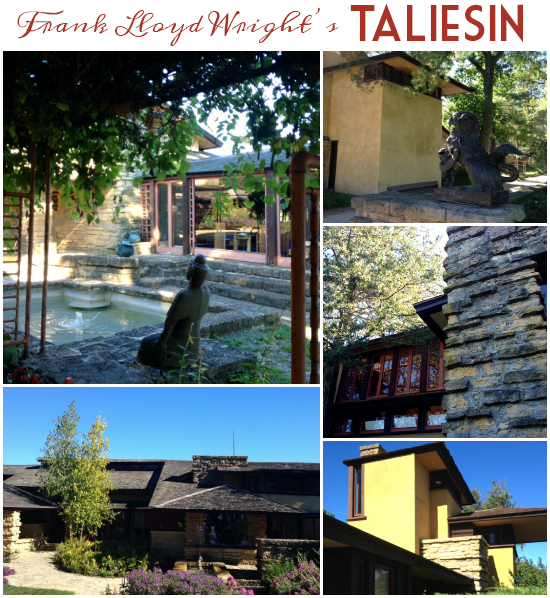 Frank Lloyd Wright also held an architecture school (which still exists today) in which his students live on the Taliesin campus & learn the design principles as well as how to use local resources like apple orchards for meals, and limestone for building. Do you have a favorite design period or artist's style you admire? Oh, this is such a brilliant idea and concept since visiting FLW. I've visited his architecture in Chicago, NYC, & PA! I, for one, am a HUGE fan of his utilitarian style.